This post was written with contributions from Joan Gass, Scott Weathers, and a third coauthor who would prefer to remain anonymous. Our team came together primarily motivated by an effective altruist perspective. We believe that alleviating animal suffering is a top moral priority, that the issue is relatively neglected, and that improving supply of alternative meats (e.g. clean meat, plant-based meat) will be more effective than reducing demand for meat (e.g. dietary behavior change). At the time we started researching the topic, all of us were still in graduate school. Each of us had between 9 months to 21 months before our degrees were complete. Our goal as a team was to identify whether there was a high-impact for-profit alternative meat startup we should launch (plant-based meat or clean meat). We wanted to pursue an idea that (1) had high potential for social impact, (2) was commercially viable, (3) we could feasibly deliver on given our skills and network, and (4) fit within our longer-term career goals. We started this research in September 2017 and aimed to reach a decision after 5 months of research (enough time for the member of our team that was graduating soonest to make post-graduate school plans). By the end of our research (February 2018), we decided to hold off on pursuing an alternative meat startup for the time being. We identified promising opportunities we think could have strong social impact and commercial potential, but we felt these were not ideal from a personal-fit perspective at the moment. In particular, we felt we were not uniquely positioned to pursue these opportunities and that they were not ideal from a professional standpoint given our medium-term personal career goals. However, we each remain excited about the space and remain open to pursuing these ideas in the future. We want to encourage other potential entrepreneurs to enter this space, as we feel there are substantial opportunities to do good and do well. We are writing this document to share what we’ve learned in the hopes that it will encourage and help others contribute to the industry. We would be happy to speak with individual entrepreneurs or researchers to share what we’ve learned. ● Team member #1: Current Stanford Business School / Harvard Kennedy School dual degree student. Previous experience as a management consultant at Bain. ● Team member #2: Current Harvard Business School / Harvard Kennedy School dual degree student. Previous experience as a management consultant at Bain. ● Team member #3: Harvard T.H. Chan School of Public Health student (now graduated). Previous experience in political lobbying and startup nonprofits. Expected social impact: What is the overall impact if successful, multiplied by the probability of success? Market attractiveness: What is the total size of the market? What percentage would be feasible to capture? How fierce is the competition? What is the market power of buyers & suppliers? What is the growth of the market? Economics: What margins could we expect? How profitable is the business likely to be? What investment would be required? Personal fit: Do we have the expertise on our team to deliver on this idea? Does it fit in with our long-term career aspirations? To try to narrow down some of the ideas, one of the first filters we tried to apply was plant-based meat vs. clean meat. We thought we might eliminate one of those categories and focus our efforts. We talked to several individuals to determine if we should consider clean meat. We found clean meat appealing because we anticipate that clean meat, if it becomes cost-competitive with farmed meat, will be much more likely to reach mass-market status than plant-based meat. It would therefore have much larger social impact if successful. However, we were concerned about the technological challenges associated with clean meat, the high degree of uncertainty surrounding the timeline of clean meat development and the costs of at-scale clean meat production, and our current lack of technical knowledge around clean meat. We conducted a preliminary analysis of the clean meat value chain (see section 5 below) to identify start up opportunities in this space. We ultimately did not end up using plant vs. clean meat as a filter, and explored opportunities in both spaces. Another filter we considered was the type of meat we wanted to produce (e.g. chicken, fish, beef, pig products). We knew that our meat alternative startups could have large effects on a wide range of issues, including antibiotic resistance, climate change, nutrition, and more, making this an attractive option to many different value sets. However, one of the social impact lenses we analyzed in depth was alternative meat’s impact on animal suffering. Past research indicates that the size of animal is a key driver of the amount of suffering that its associated products generate, since smaller animals will tend to produce much less meat per unit of suffering caused. In addition, research in Compassion, by the Pound indicates that pigs and chickens suffer substantially more than cows in factory farms. Evidence seems to indicate that chicken and fish products cause the most suffering on standardized metrics (1, 2, 3, 4, 5, 6). According to one uncertain analysis that tried to estimate “equivalent days of suffering” caused by different animal products, production of a single kilogram of catfish causes 1600 days of suffering compared to 66 days for a kilogram of chicken and 1.9 days for a kilogram of beef. Acting on this belief, we would strongly encourage other potential startup founders to consider focusing on eggs, chicken, fish, or related products if they prioritize decreasing animal suffering, as we believe these present the best opportunity for overall impact. Given that these animal proteins are often consumed as ingredients in products where they could easily be substituted, we believe there is large room for impact currently being neglected. Notably, although we believe that fish alternatives are likely net-positive in expected value, we have a large degree of uncertainty regarding this conclusion. Since it is not clear whether wild-caught fish have net-negative or positive lives, we can’t be confident about the impact that displacing ocean fishing would have. A variety of other considerations, including the substitution of farmed and wild-caught fish products, will affect the impact of any startup devoted to fish products. We appreciate the work of Georgia Ray in researching this question for us, and would greatly appreciate other researchers focused on wild animal suffering to continue developing empirical evidence on this question. As a result, one of the preliminary filters we applied was to look at fish and chicken products in the clean meat and plant-based meat space. After an interview with a food scientist from Impossible Foods, we identified that ‘whole muscle’ proteins like fresh and frozen fish fillets and chicken breast are harder to develop. We therefore primarily focused on non ‘whole muscle’ proteins like fish sticks and chicken nuggets. These products are easier to produce as they have a more flexible texture and gain a large proportion of their taste and texture from breading and seasoning. We believe that impact in this space would occur from deriving a better formulation than existing products and/or penetrating a new sub-segment of consumers. As a result, a secondary filter we applied was to look plant-based products like fish sticks and chicken nuggets. An alternative approach we considered would be to push the frontier of plant-based ingredient replicas. There are areas of seafood and chicken where plant-based replicas do not currently exist (e.g. plant-based octopus). Even in sectors with a small market size, we believe there is value to the demonstration effect that shows that new plant-based replicas are possible. Additionally, we believe there are markets in which consumers are less attached to animal-based products, such as eggs in baking and as ingredients in prepared foods, fish sauces, and surimi (e.g. crab in sushi). Given willingness of consumers to accept substitutes, a plant-based alternative at a lower price point has promising market reach. Finally, we believe that egg-based replicas are likely particularly high impact given the harm experienced by egg-laying chickens. We ended up not pursuing these opportunities in depth as we did not have connections with technical expertise to push forward the innovation frontier in this area. 1) Plant-based fish sticks or chicken nuggets: One idea we had was to develop an extremely low-cost product, likely to sell through existing restaurant chains and/or grocery stores, along the lines of what Seattle Food Tech is producing. Fish sticks and chicken nuggets may be may be among the worst products in terms of marginal animal suffering, have large annual sales, and do not rely primarily on animal meat for taste/texture, making them a viable candidate plant-based substitutes. We conducted research with food service companies in schools and found that cost, meeting official nutritional guidelines (to qualify for reimbursement), and taste were critical components. Packaging, refrigeration requirements, shelf life, and allergens were also considerations. Some purchasers even indicated a willingness to pay a price premium for plant-based meat if other criteria listed above were met. We believe that these purchasing criteria extend to other food service companies (such as hospitals and prison systems). If we were to move forward, we would want to understand the competitive positioning of current plant-based fish stick and chicken nugget companies and have a clear differentiated value proposition. We believe that working with a co-packer to produce a white-labeled product for large food service providers could be an efficient way to launch with minimal marketing spend. However, the financial margins for these products appear to be small, meaning that startups attempting to take this problem on may have to accept razor-thin profits. Developing capacity to produce in large volumes would therefore be critical. Reports we’ve heard indicate that extrusion capacity is currently the limiting factor driving up costs for plant-based alternatives in the United States. As a result, we’d only want to pursue this path if we have strong reason to believe that our plant-based alternative was not displacing a better plant-based alternative in the market. Our initial interviews suggested it is possible to produce products that does not require extrusion (perhaps using jackfruit) which could enable higher volume production at lower cost than current products on the market. We encourage entrepreneurs to explore this route. 2) Plant-based functional meat in India or another Asian economy: We considered developing a company to produce broadly usable “functional meats,” which can be used as an ingredient across many recipes, represent a promising opportunity to reach consumers cooking at home, restaurants, and makers of processed foods. At low-cost, these products could substitute for a broad range of animal-based ingredients in curries, biryanis, and other Indian dishes. We selected India as a promising country because our research team has some experience working there, a large proportion of the country speaks English, consumption of fish and chicken is growing, and a high proportion of the country is vegetarian. We were also excited about working in a developing country to promote economic growth (e.g. strengthening local manufacturing). We did not move forward with this idea because of our limited ability to understand the competitive positioning of existing companies in India (e.g. Good Dot) and our limited connection with manufacturing / food science talent in India. We would encourage entrepreneurs to continue to explore the space. In addition to India, we encourage entrepreneurs to explore China ($161B in meat / livestock), Japan, Thailand, and Vietnam – particularly if the future co-founder teams have a relevant cultural or linguistic background (see the appendix for estimates of market size for the meat & livestock markets in Asia-Pacific). a) Cell lines: It is our understanding that most clean meat startups already have their own cell lines or plan to identify cell lines in-house. b) Media: Media appears to be the largest cost contributor and most important immediate barrier to clean meat scale-up, so we were most excited about a startup in this space. However, it’s our understanding that another startup (tentatively named “Oxford Culture Media”) has recently received funding to do just this. We expect there will be room for multiple media companies in the clean meat space, but weren’t yet confident that it made sense to form another startup at this time. c) Scaffolding: We expect scaffolding will be much less important in the short-term as clean meat companies are likely to first focus on ground meat products. Scaffolding research will be important in the longer term, however, to develop structured products and potentially to improve the efficiency of bioreactors. d) Bioreactors: There is urgent need to advance bioreactor technology for clean-meat. However, we are uncertain whether a startup would be ideally positioned to develop bioreactors, which are engineering-heavy and highly capital intensive. We imagine that larger, established companies may be better positioned to produce bioreactors for the field. Based on this thinking, we explored two potential start up ideas in the clean meat sector. 3) Providing B2B clean meat technology services: Focus on one of the intermediary technologies - for example, identifying cell lines, developing media formulations, researching scaffolding, or developing bioreactors - and sell to clean meat startups. This space appears generally open and attractive, although we did not find an ideal point for us to enter (see analysis above). We have heard that larger, established biotech companies are thinking of moving into this space, which may crowd out opportunities for entrepreneurs. 4) Plant-based & clean meat chicken-nugget hybrid: Our idea was to first develop a low-cost plant-based chicken nugget, with the goal of eventually incorporating clean chicken meat as an ingredient to produce an inexpensive clean chicken product. Success here would depend on being first-to-market with a clean meat technology that is differentiated from competitors. While a growing number of companies have already entered the clean meat space, our sense is that there are a variety of approaches to clean meat production yet to be tested, and a new startup might still have room to carve out a technological niche. We believe that clean meat companies should pursue, and are pursuing, blended plant and clean meat based products, which will be easier to develop than pure-clean meat products while the technology remains new. Our investigation of clean meat was preliminary, and our thinking remains highly subject to change. We intend to stay in touch with our contacts to continue updating our position on clean meat. We would be excited to eventually partner with a scientist in this field as we build our understanding of the technology, economics, and timeline. We are 1) excited about the research currently underway, 2) convinced that much more R&D is needed in this space, and 3) hopeful that clean meat products (perhaps combined with plant-based ingredients) will eventually break through. After speaking with a half dozen entrepreneurs, scientists, and experts on this topic, our tentative conclusion is that mass commercialization of clean meat may still be years away (perhaps 5-10), and there remains significant uncertainty around this timeline, although a small number of high-end, niche products may emerge soon (6-24 months). Whether we eventually get involved in clean meat depends on whether we can find a strong technical co-founder with clear ideas on a differentiated approach to the technology. We have some potential leads and will continue to try to cultivate partnerships. As we were ramping up on the space, we found the Good Food Institute particularly helpful in providing an initial orientation. As we were researching relative animal suffering, we found writings by Lewis Bollard, Brian Tomasik and Compassion, by the Pound by Norwood and Lusk valuable resources. As we were researching the plant-based meat space, we found GFI’s plant-based meat white paper, Market Reports (our university library was helpful to find these), and speaking with individuals in our academic / personal network (including GFI directory & FEED Collaborative at Stanford) very valuable. As we were learning about the clean meat space, we found GFI’s Clean Meat white paper, the book Clean Meat by Paul Shapiro, and speaking with individuals in our academic / personal network (including GFI directory) particularly helpful. ● Competitive advantage: We do not feel that we have yet identified a clear, defensible competitive edge in any of our priority business ideas. For example, while we feel there is a need for cheaper clean chicken and fish, we expect that existing players will be able to produce these products, and were not yet able to identify how we could develop a defensible advantage (although we have not ruled out the possibility of finding this in the future - particularly if we were connected to a technical cofounder or unique product approach). ● Personal fit: We are working on other projects and long-term interests that more directly leverage our past experience and fit more clearly into our longer-term career aspirations. For example, some of us are more focused on influencing policy in the long-run, which we believe would be the most impactful use of our skills, and we felt the ideas above didn’t clearly facilitate this trajectory. We also have not yet found a strong technical cofounder, which we think would be important given our lack of technical skills. We remain deeply passionate about meat alternatives and open to the idea of launching a startup in the future, but we felt at the time being the personal fit and timing wasn’t ideal. We also feel that the food industry is in general competitive and challenging to reach profitability without significant scale. However, this concern is somewhat offset by the rapid growth of alternative meat products, the amount of investor enthusiasm for alternative meat, and the significant social impact potential. We would be excited to hear input on our conclusions. If we were to move forward, we would significantly hone & sharpen this timeline. We include it here just to share some of the input we gained from interviews. We performed preliminary price benchmarking that may be useful to prospective entrepreneurs. *Estimate of the average national figure for Feb 2017; ** WTP = Willingness to Pay, PBM = Plant-based meat. Nutritional yeast protein estimate: bulk price of yeast is ~$6/lb, roughly 50% protein by weight; Soy protein isolate estimate from here. We looked at mycoprotein (the protein used in Quorn products) as an upper-bound benchmark to estimate the maximum plausible caloric efficiency that clean meat production could achieve. Cost savings from clean meat relative to farmed meat are likely to come primarily from lower feed costs, which comprise the bulk of farmed chicken costs (60-75% of costs based on our research). As such, we focused on estimating the savings that would come from the higher caloric conversion efficiency of clean meat. Mycoprotein is developed using a similar process to suspension culture: fungal cells are mass-produced through cell division in bioreactors using wheat & corn calories and minerals, and later combined with plant ingredients to form a final product. Our understanding is that fungal cells have similar metabolic efficiency to animal cells, and one expert told us mycoprotein may be easier to grow and more efficient than avian and mammalian cells. As Quorn has had decades to refine the mycoprotein production process (since 1985), we suspect they are approaching optimal efficiency. As such, the caloric conversion efficiency of Quorn’s mycoprotein process seems reasonable as an upper-bound limit to what clean chicken, once optimized, could achieve. 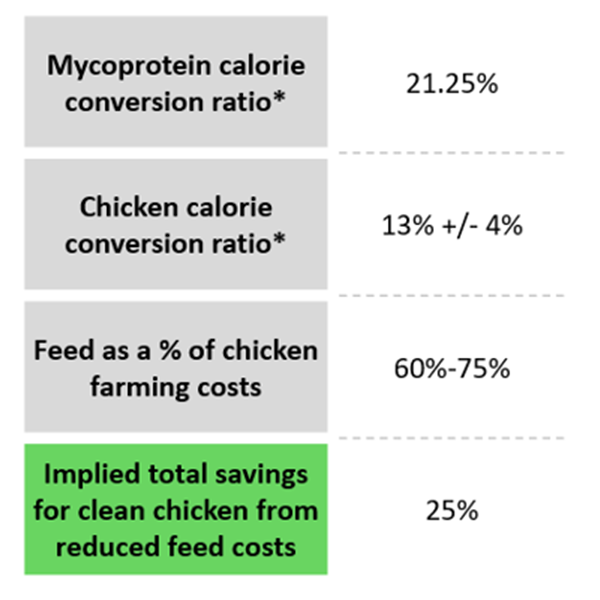 Given this benchmark, we estimated that clean chicken could see up to 25% variable cost savings (assuming, optimistically, it reaches the calorie conversion ratio of mycoprotein) compared to farmed chicken due to savings from feed, based on the figures below. We anticipate that non-feed costs are likely to be higher for clean chicken due to the investment required for sterilization, expensive bioreactors, skilled labor, and greater R&D requirements. Clean chicken will only be cost-competitive if all of these additional costs fall below the 25% potential variable savings from feed. This estimate suggests that clean chicken may be able to beat farmed chicken on a variable cost basis once fully optimized, but we are uncertain whether it would remain cost-competitive once accounting for fixed costs. Great write up. I'm a fan of the systematic thinking and research. It's interesting to compare how you approached it to how Charity Entrepreneurship are looking into non-profit startup opportunities. I'm interested in how you weighed up the decision criteria; was this just intuitive, based off the rest of the research, or did you have another approach? One area where I might diverge from your approach here is in how you conceptualise expected social impact. I get the impression here (mainly from your use of "Filter #2: Social Impact - Comparing Animal Suffering") that you primarily conceptualise the impact of a startup in terms of the the products that that startup produces and the animal products that it replaces counterfactually. But a broader conceptualisation of the impact of a startup might include its contribution (positive or negative) to the overall eventual success (i.e. market share) of plant-based meat and/or clean meat. In the long-term, this could well matter more for total impact. 3) Focusing on marketising the products in countries which are more likely to be supportive, even if the total market is smaller, e.g. Singapore (see here). In each of these examples, bringing the products to market in those specific contexts might increase consumer acceptance of the higher priority products, since they (or lots of people in other countries) will already be using cellular agriculture products. A different approach might be to starting a B2B startup which focuses on providing a cheap - but also stable and secure - specific ingredient, e.g. growth media (this one overlaps with some of your suggestions). This might require that their business focuses on selling to a broader customer base, including medical companies and scientific researchers, to ensure that they have a business model that isn't wholly dependent on the (potentially fluctuating) fortunes of the rest of the clean meat supply chain. Potentially these strategic concerns might matter less for plant-based foods. I can think of ways it would influence decision-making though, like focusing heavily on price, so that less well-off people can access plant-based foods, to reduce the risk that plant-based food becomes confined to well-off people and specific demographics (hippies/hipsters) due to the real barrier that price puts up and/or due to public perceptions and identity issues. Generally, I'm arguing for considering a long-term "strategic" perspective to thinking about the social impact of start-ups. J at Sentience Institute has written two technology adoption studies on nuclear power and GM foods which I think are helpful for thinking about these sorts of perspectives. He's currently writing a third, on biofuels - I imagine that that will be similarly useful, and that we'll start to see trends and patterns occurring across the technology adoption studies as he does more. Wonderful writeup! Strong upvote for the structure, use of tables, and analysis of future possibilities. You may want to define, or link to definitions of, terms like "scaffolding" and "extrusion" that may not be familiar to most readers in this context. Also, despite not having a technical co-founder on the team, did you still feel like you were able to conduct effective research on alternative-meat engineering? It seems like you have a pretty thorough understanding of technology in the space, and what products might be useful to develop, but I can imagine that taking a long time or being really difficult without a technical background. Do you have any advice to share on learning to understand a field's engineering, product development, etc., without a strong background in those subjects? I'd also love to hear Scott's perspective on this, but in the meantime, I wanted to point out that this is one of the ways The Good Food Institute aims to help potential founders. For starters, I'd recommend these essential resources. Thank you so much for writing this up, I'm sure it will be really valuable for teams considering a similar move, whether right for them or not, in the future. Thank you so much for sharing this research publicly! I'm also looking at the value chain in the clean/alternative meat space with an eye towards entrepreneurship or joining an existing co. so seeing the results of your work is very helpful. 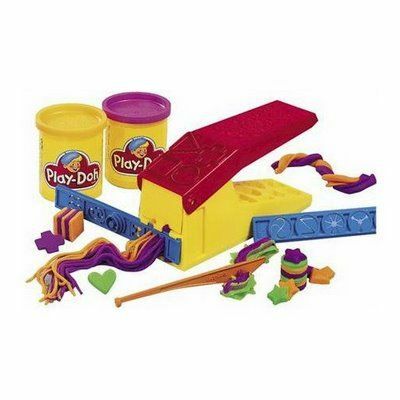 Most plant-based meats get their form and texture through high-moisture extrusion, in which textured vegetable protein is forced through a die like Play-Doh through a spaghetti maker (see Wikipedia for a more technical overview). Extruders are big, expensive, and sensitive machines. Most startups can't buy their own, so they normally contract with a manufacturer. However, there is a limited number of manufacturers that currently do high-moisture extrusion of textured vegetable protein. I like this way of thinking. It's important to consider whether our direct impact is actually different than the counterfactual. 1. A new plant-based meat company creates new demand for extrusion capacity. Consistently increasing demand for extrusion capacity signals to manufacturers that they should invest in capital expenditure. 2. Alternative manufacturing processes are being developed that do not require high-moisture extrusion (e.g., sheer cell technology). A new plant-based meat company could either directly contribute to developing these technologies or indirectly contribute by demonstrating demand for the technology. 3. Extrusion capacity tends to go to the producer with the highest willingness to pay. In general, this will favor companies that are more mature, have higher sales, or have more investment. Although imperfect, these factors correlate with product quality, decreasing the likelihood that a worse product will displace a better one.